Curves to Kill...: Hell Bunny 2013 Review! The time has come once again for me to slip into a few newer styles from Hell Bunny and tell you my lovely readers about the different shapes, fits and fabrics. In the last 6 to 12 months I've noticed a lot more coming out from HB. More shapes, styles and prints. With this variety I thought it was a great time to try on a few new garments and give you the low down. To find multiple online shops to purchase these items from other than the links listed please click on the following links for all my previous Hell Bunny posts : Hell Bunny Feature, Tiki Time and Polka Dots, Monsters and Sailors Oh My! I'm wearing all items in a size XL. A mixture of old and new, pinup and modern styling all rolled into one. This oriental inspired wiggle dress is the bees knees! The fabric lush and sturdy, holding you in and making your curves pop. The fit is very tight in the XL as you can see it's almost like it's painted onto my curves. I love the fit around my hips and waist but with the peekaboo bust it seems to be a little too snug for my GG cup bust. I paired this with the perfectly complimentary orange Wide Eyed pumps the always brilliant Luchiny and I think they work wonderfully with this pattern. I do adore this fabric and hope that many more styles and separates are made from this or even a few different colour ways. I would own them all! 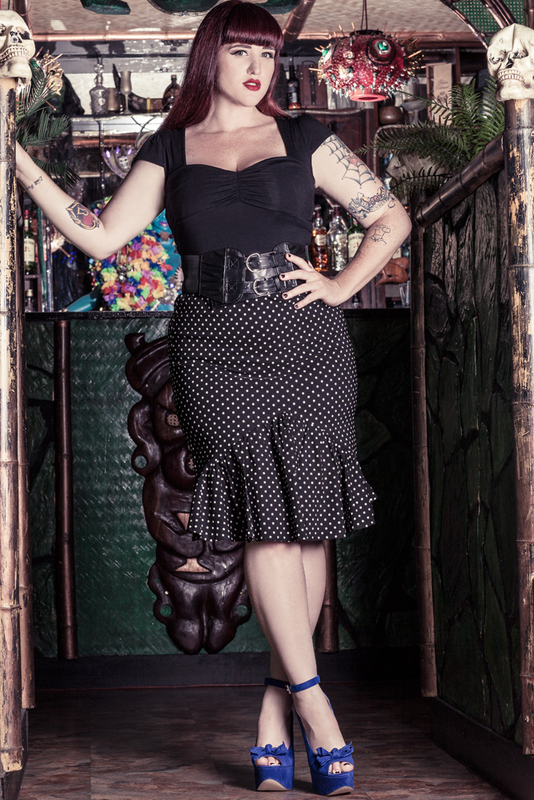 An adorable high waisted ruffled pencil skirt that every pinup/retro girl needs in her closet! This style is made from a very stretchy rayon, nylon spandex blend an due to the movement in the fabric I highly suggest you size down. I found the XL in this style really, really roomy around the waist and bottom but I fixed this with a very thick waist belt. I will have to have this style taken in for future wear. The ruffle detail both the front and the back of this garment is to die for! Pairing this black and white outfit with one of my favorite styles from Luichiny the Vanessa. It's a peep toe version of the Eye Doll and I'm swooning for this style. Continuing on with the same fabric the Pauline dress is a super cute mini pencil dress with a pleated bow bust and capped sleeves. The fabric again is very stretchy but for this style I'd opt more to get it slightly taken in around the waist and hips apposed to sizing down ad the bust is perfect. This style slightly shows your bra but I actually like the hint of colour peeking through. I'm wearing my own belt as the Pauline dress comes with a thin waist belt but I like the thicker styles myself. I've been wearing this heaps over summer with flats, cowboy boots and heels! It can go from day to night with ease. A close up of my Poison Necklace from Debstar Designs. I'm head over heels for this little pedant! So cute! Then lastly one of the most adorable prints I've stumbled across in recent years. Anchors, palm trees and stars combine together to create the adorable Shirley Mini Dress. This is the dress you will want to live in on those super hot summer days. The fabric is flows and just glides over your skin, it's weightless and really lovely to wear. The little cap sleeves are great if your like me and you like to hide a little of your arms ever now and then. I paired this with a bright patent red belt and I think the combination works perfectly! The bust was a little tight fitting at first but with the right bra and a little movement this now fits like a dream. I will be packing this in my 'Vegas' bag for sure! If you want to find a local supplier for any of these items either google the product name or even ask Hell Bunny directly on their facebook fan page. What's better than one anchor? Two!! I've been wearing this necklace with my 'Smitten' name necklace a lot recently. So remember all items are in and XL and if you need any further help just leave me a comment bellow. Many thanks to the awesome dream team over at Robin Elk Photography for working with me on this an a few other posts. It's always a pleasure to make magic with you guys. Also a huge thank you to the brilliant people at The LuWOW who let me shoots once again in their amazing venue. If you live in Melbourne or visit Melbourne you must get to LuWOW at 62-70 Johnston Street Fitzroy. This venue is not only amazing visually but they have brilliant shows, epic cocktails and the loveliest staff. I love how specific the details!! I love the brand Hell Bunny, make a perfect figure! They all look great! But I especially lov that polka dot fishtail skirt.